Once the dominant online FPS title on Xbox LIVE, Halo 3 has fallen slightly to the wayside in recent times after the schism caused among gamers by the release of Call of Duty 4 last fall; a divide which continues to polarize the gaming community to this day. That should all be changing soon, or not, with the release of new downloadable content available on Xbox LIVE Marketplace today. The Legendary Map Pack, available for 800 MS Points, includes 3 new maps for multiplayer fragfests, as well as new options available in the Forge map creation system. 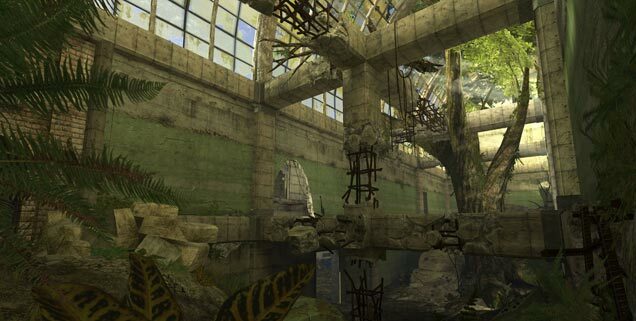 The Halo 3 Legendary Map Pack is actually a mix of a little of the old, along with the new. Two of the new maps, Avalanche and Blackout, are actually throwbacks to previous Halo titles. Avalanche, you may remember, was first featured in Halo: Combat Evolved, but will now feature brand new vehicles, interiors and exteriors to refreshen the experience. And Blackout recalls the “Lockout” map from Halo 2, but has been aesthetically reimagined. Fans of its small battleground feel during slayer matches will be pleased nonetheless. Ghost Town is the new addition to the Halo multiplayer map family. This map features collapsed ceilings and decrepid ruins which can be used for cover and for traps alike. It’s “claustrophobic ground combat” and “dizzying rooftop battles” are sure to make it a crowd pleaser for fans of Team Slayer and smaller objective matches. With the updates to the Forge system, players will have the ability to create more detailed challenges and map variants than ever, while also utilising a variety of visual effects to create new, unique screenshots and saved films. There is extra incentive to hop on these maps right away. Fraggers who purchase the Legendary Map Pack will receive a four month subscription to “Bungie PRO” via Xbox LIVE, but only for a limited time. Bungie PRO will allow players to upload and share more films, maps, screenshots and game-types than ever before, increasing the maximum number of file share storage slots from six to twenty-four while also increasing the total file storage size to 250MB. See kids? Sometimes good things come to those who don’t wait.